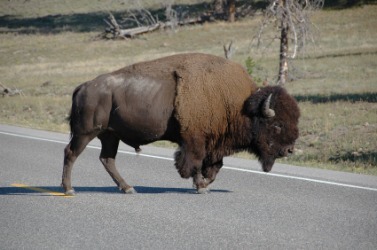 American buffalo crossing a road. The definition of a buffalo is a large wild ox with horns that point to the back. An example of a buffalo is the water buffalo. To buffalo is to confuse or deceive. An example of buffalo is to convince someone to get a loan with a very high interest rate by suggesting that the interest rate will be low. "buffalo." YourDictionary, n.d. Web. 19 April 2019. <https://www.yourdictionary.com/Buffalo>. Any of several North American suckers of the genus Ictiobus, having a dark body and an arched back. Also called buffalo fish . Italian bufalo or Portuguese or Spanish búfalo from Late Latin būfalus from Latin būbalus antelope, buffalo from Greek boubalos antelope perhaps from bous cow ; see gwou- in Indo-European roots. Word History: When most Americans hear the word buffalo, they probably think of the American bison. In fact, buffalo originally referred to the water buffalo (an animal that was introduced to western Europe from Asia in late antiquity) and other large bovid animals of Eurasia and Africa. The history of buffalo begins with the Greek word boubalos, “antelope.” The Romans borrowed this word as būbalus, “antelope.” In his work on natural history, however, the Roman author Pliny the Elder notes that the common people used būbalus to refer to the urus, the huge wild ox (now extinct) that once roamed northern Europe, and Pliny considered this to be a mistake. Eventually the Latin word, in its Late Latin form būfalus, became the name for the water buffalo when it was introduced to Europe. Būfalus developed into buffalo in Italian and búfalo in Portuguese and Spanish, and then English borrowed buffalo, with the sense “any of various species of large bovine animals,” from one or more of these languages. How did the word buffalo come to be the popular name for the American bison? When the English first began to visit and settle in North America, it is likely that most of them had never seen the European bison, or wisent, the closest relative of the American bison. The wisent had mostly vanished from western Europe in the Middle Ages, the victim of hunting and deforestation. The English were probably much more familiar with domestic water buffalo, and they may even have heard of the urus, and so when they encountered the American bison, many of them called it by the name of the largest bovine animal they had known before, the buffalo. Already in 1625, English writers were using buffalo to describe the bison of America. (US, slang) To outwit, confuse, deceive, or intimidate. A city in New York State, very near Niagara Falls. When they stepped outside, the buffalo were grazing near the pond. Today they would put the buffalo and longhorns in the same pasture.